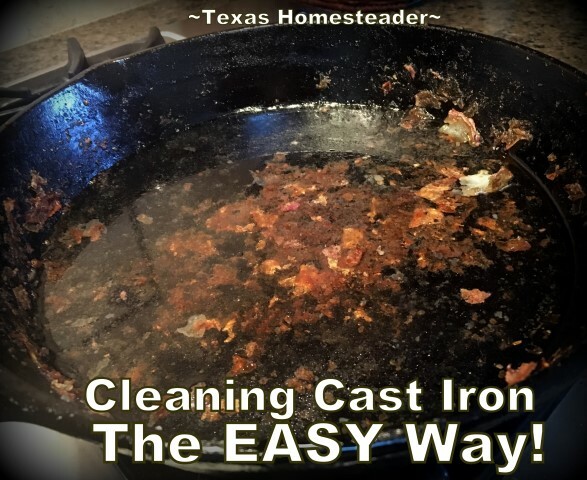 Some people scrub using elbow grease with salt or a metal cast-iron cleaning pad. I don’t even have to go that far, my way is easiest in my opinion. First I place just enough water to cover the surface of the skillet. I don’t need much, just barely enough to cover the bottom surface of the skillet. Then I place it on the burner and turn on the heat. Since there’s so little water in the skillet it takes less than a minute to get things simmering. Then I simply place a lid on the skillet, turn off the heat and let it all cool down on it’s own as I go about my other kitchen-cleaning tasks. This basically steams loose the stuck-on food. By the time I finish cleaning the kitchen, the water in the skillet has cooled. So I remove the lid and use my spatula to effortlessly scrape away the previously stuck-on food. I’m not kidding – it’s THAT easy! It all scrapes away easily without sticking to the bottom or sides of the skillet. So I scoop out the food I’ve scraped away & throw it in the trash. Then I take my cast-iron skillet to my sink where I use my dish scrubber and hot water to finish cleaning it and BOOM! 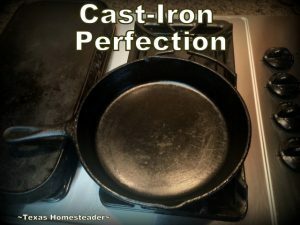 Cast-Iron Perfection. If needed I’ll run a thin layer of grease along the inside surface to keep it seasoned beautifully. Then back into the storage drawer where it’s ready and waiting for next time. Cast iron is my favored cooking material. It’s easy to maintain and it lasts for decades. I have several cast-iron skillets of various sizes, but my favorite is my grandmother’s skillet. Isn’t she a beauty? This square cast-iron skillet was presented as a wedding gift to my grandmother back in 1934 when she and my grandfather were married. Then she gifted it to me back in the 1990’s and I’ve been using it ever since. Of course I’ll be passing it on to my children as well. It’s hard to say whether any modern cookware has THAT kind of longevity! I call that, “the ghost of the house” when no one wants to own up to something. Too bad about your Dutch oven. Years ago my kids made a pan of mac and cheese, took the pan outside to eat it. I couldn’t find it and they, of course had no idea what I was talking about. A year or so later it was winter time and the leaves were all off the shrubs. I looked outside and thought “What the heck is that shining out there in the back of beyond?” Upon investigating it was my pan. The handles were in bad shape but I was able to replace them by contacting the company. The boys didn’t know what the heck I was talking about and had no idea how a sauce pan would have made it’s way to the back yard. I love my old cast iron skillets. I’ve never put a lid on them at cleaning time but I do put them on the stove with water to loosen some stuck on stuff. My 3 are all Griswold brand, made in the USA, I can’t remember now where I came by them. I have a “modern” set of cookware that I bought when I graduated from high school (1965). They are stainless steel layered with cast iron. They are one of the early “waterless” sets. The birdman didn’t believe me when I said that I could steam vegetables with about an 8th of an inch of water in the pans. Over the years I have had to replace some of the knobs, but I can still get them. While I love them to pieces I almost never use the fry pans, just the dutch oven and the sauce pans. 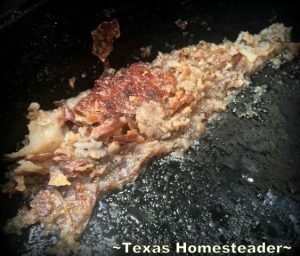 The cast iron is for frying! I have stainless steel revereware pots (old not the lighter new ones), and a cast iron skillet as well as an enamel covered cast iron skillet and matching Dutch oven. I had a smaller enamel covered Dutch oven but I think my daughter took it someplace for a pot luck and it never made it home. I use me enamel covered for probably much the same as you use your stainless. I started out with those and have since moved on the one regular cast iron. 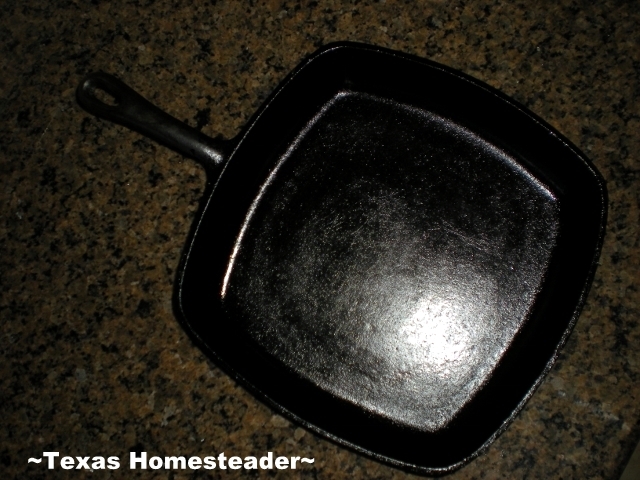 I actually have four different sizes of the enamel covered skillet, then I asked Miss S to look for cast iron for me. She didn’t find one but I found one at a second hand store in Washington for half price and it was a good well known brand so I snatched it up. Can’t beat it for $7.50.